By Dina Rosenfeld A beautifully illustrated re-writing of a midrash about Dovid, who became King of Israel. It deals with Dovid's youthful job as shepherd for his father's sheep and how he was so concerned that the little sheep and old sheep should get enough to eat. When he noticed that only the big young sheep got to eat, but the little ones and old ones never got a chance, Dovid worked out a plan so that all the sheep would eat. G-d decided that since Dovid took such good care of all the sheep, he could also take good care of every single Jew. A lovely midrash, beautifully rewritten. By Jean Marzollo The third title in an exciting new series by Jean Marzollo, here is another refreshing rendition of a well-loved classic that will appeal to families looking for accessible introductions to the timeless lessons of the Bible. Meet the musical and poetic David, who surprises everyone when he draws on his faith, determination, and skill and accepts the terrifying challenge issued by the enormous warrior Goliath. A chattering flock of little lambs gambol in the border running at the bottom of each page, adding the childlike commentary and humor that makes this series so unusually dynamic. Marzollo's energetic illustrations draw the reader into the heat of this suspenseful tale. This story is more than a typical Bible picture book. Jean Marzollo created a book in which children will find something new each time they read it (and they will want to read it over and over again)! David works as a shepherd where he loves to sing and play his harp. One day, his father asks him to bring food to his brothers in the army. When he arrives, he discovers that they are being challenged by the giant Goliath. After each day's challenge, the Israelites always run away. David decides that he will fight Goliath. He refuses to wear the heavy armor and goes to face Goliath armed only with his slingshot. He takes five smooth stones, and aims one directly for Goliath's head. With only one shot, David hits Goliath straight in the forehead and kills him instantly. This book features a conversational narrative, comic-book style conversations, poems to be sung to the tune of "Twinkle, Twinkle, Little Star", and a lamb's commentary at the bottom of each page encouraging children to think further about the story. An excellent choice for elementary school readers. By Emily Little This accurate and upbeat version of the Bible story is written with a limited vocabulary suited to beginning readers. Although the sentences are short and simple, they are nicely varied and read aloud well. The cartoon style watercolor illustrations in warm tones are well-designed, amusing, and expressive, with a variety of perspectives to add interest. All of the figures have a short, childish look which makes them less menacing. Goliath, a burly loudmouth with spiky red hair and beard, is a satisfying bully, toppling like a felled tree and looking quite peaceful in death. David is shown strumming his harp amid a sea of smiling sheep, bopping a lion about to pounce on a lamb, carrying food to his older brothers in the army, dropping Goliath with a well-aimed stone, and being hailed as a hero by the Israelite soldiers. A good choice for reading aloud and for beginning readers. By Patricia A. Pingry This little book tells in about 200 words, the Story of David introduces the young child to the concept of courage and trust in God as it tells the story of David, Israel's greatest king. This board book features a very simple narration of the classic story of David and Goliath. The book has only one or two sentences on each page. A kid-friendly font is used and key words are written in larger type. This board book is appropriate to explain the story of David to toddlers. By Patricia A. Pingry This classic story of the underdog who defeats the giant is one every child loves because it gives even a toddler the sense that he can accomplish big things. In this story, the emphasis is on the child David and his certainty that he can conquer what the king's army cannot. 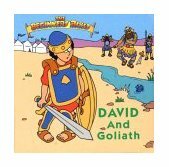 This board book is the better of the two written by Patricia Pingry featuring the story of David and Goliath. The book features a very simple narrative style. Children will find themselves easily relating to David and the other Biblical characters. ("David watched as his brothers and the Israelites turned right around and ran away! They were scared!") The illustations are bright and cheery. This board book is appropriate to explain the story of David to toddlers. By Janis Hansen David is brave and strong, but knows it is G-d who keeps him safe from harm. So when a giant threatens David's friends, he is certain of how this battle will end. This package includes an illustrated storybook, interactive CD-ROM, dramatized audio cassette and fun activity book that all work together to communicate one of the Bible's most exciting stories to children. By Andrew M. Gutelle Delightfully illustrated, beautifully written accounts of the Bible's most popular and pivotal stories. Written for today's children. Retells the story of the shepherd boy who relies on his faith and defeats the Philistine warrior who has led an army against Israel's King Saul. Your favorite Old Testament Bible characters come to life in this CD-ROM for children and adults. The Beginner's Bible features activities based on three beloved Bible stories and star characters from the "Beginner's Bible", the best selling children's Bible in the world. The benefit of the Brighter Child's CD-ROM version of The Beginners Bible is that children actually interact with the beloved Bible characters as they learn the important Biblical lessons. The activities that come with the program are impressive and relevant for young children. Adults love working with their children on the activities as well. "The Old Testament Favorites" includes the following stories and activity centers; MOSES IN THE LAND OF EGYPT, Moses in the Land of Egypt is an interactive storybook featuring the story of Moses plus more than 30 video clips from the Sony Wonder animated video, 18 Storybook Pages, 6 interactive games, 6 Coloring Pages, and a Sing-A-Long Song. The result is more than a computerized video. The activities and song assure that all children will return to the program time and time again. NOAH'S ARK ACTIVITY CENTER, Noah and his family are very busy following God's instructions on how to prepare for the great flood. Join them as they get ready. Help Noah Build the ARK, Shop for supplies and Gather the Animals in a series of 8 fun and educational activities and 6 printable arts & crafts projects. YOUNG DAVID ACTIVITY CENTER, God has chosen a young shepherd boy to become the new king of Israel. Help David on his way with 6 fun activities including, Target Practice, Find the Stones and sing along with three original songs "Goliath," "Best Friends," and "Great Big Beautiful Heart." By Therese Johnson Borchard Having been transported by her emerald Bible back to the time of David, ten-year-old Whitney helps him fight the giant Goliath and thus gains the courage to confront an intimidating girl at school. By Tracy Harrast This delightful book shares the exciting Bible story of young David's victory over the giant, Goliath. By Mary Auld Each book from the publisher's Bible Stories series includes a retelling of an Old Testament story, told partly through dialogue and partly through narration. The good-sized type will encourage readers just beyond the beginning reader stage, while the many richly colored illustrations make the books accessible to younger children as well. The composition of the paintings has a formal quality that gives a sense of a narrative unfolding on stage--perhaps in a series of tableaux. Well chosen in terms of their inherent drama and their cultural importance, the stories of David and Goliath, Jacob and Esau, and Noah's Ark are clearly retold here. Each book ends with some helpful notes on the story and its source, a map of the Middle East during biblical times, a glossary, and a few textbooklike questions. By Yaffa L. Gottleib The famous tale of how King David questioned G-d's creation of the spider. By Nicky Farthing In this highly original retelling of Goliath's defeat, Goliath is a crocodile and David is a monkey. The warmth and humor in the portrayal of these lively animal characters will make this a favorite with children. By James R. Leininger An easy-to-read book which tells the tale of David and Goliath to expose young children to the Bible. By Alice Joyce Davidson Colorfully illustrated with rhyming verse that children will understand and enjoy, the story of David shows the truimph of faith in action. The simple type is specially designed for young readers. By Beatrice Schenk De Regniers De Regniers retells the biblical story of David and Goliath to good effect. When his six older brothers leave to join King Saul's army, young David yearns to join them, but he must stay home to tend the sheep and keep his father company. After slaying a lion and a bear that have attacked his flock, David goes to Saul and offers to fight the mighty Goliath. This picture book climaxes with David slaying Goliath, but it ends with King David looking back on his days as a shepherd boy and singing "a song of remembering and rejoicing." An appended author's note relates the background of the story. Making good use of light, shadow, and perspective, the beautifully composed oil paintings bring scenes of emotional and physical drama to life. A satisfying picture-book version of the story. Splendid new illustrations give de Regniers's 1965 retelling of the well-known Bible story drama and depth. The book begins with youthful David being tossed about and teased by his older brothers, who are leaving to fight in King Saul's army. David wants desperately to accompany them but is considered much too young. He goes off into the pastures to tend his father's sheep with his shepherd's crook, harp, and slingshot; contemplates the wonders of God and the world; and bravely dispatches both a lion and a bear with his simple weapon, as well as, later, the giant Goliath. There is a classic fairy-tale quality to this story that has kept it fresh and exciting through the centuries. The reteller has embellished it just enough to make a smoothly flowing narrative while remaining true to the Biblical accounts drawn from I Samuel, I and II Chronicles, and Psalms. Her language is dignified but not formal and reads aloud well. The text is set upon vigorous double-page spreads done in luminous, textured oils, and the action is viewed from a variety of perspectives. The wild beasts and giant are truly fearsome; and David, a slight, blond youth set among dark, muscular men, is both heroic and contemplative. by Pauline Youd These delightfully illustrated storeis are excellent ways to introduce characters from the Bible to your little ones. The stories are told simply and clearly, and the illustrations will make sharing them a fun experience. An added plus is thoughtful and pointed application of each of these Bible stories to children's lives. These wonderful books are short enough to hold attention, yet packed with good, solid, faith formation. By Mary Josephs Illustrated in full color. Lift the flaps and watch little David gather all of his strength, pull back his sling, and fell the giant Goliath. By Claudia Courtney In this charming book about David and Goliath, children are encouraged to learn more about G-d and His love while building reading confidence. This book emphasizes a special phonetic sound (long 'i') for pre-reader and emerging readers to practice. By T. F. Marsh The Israelite army is battling the evil Philistine army. David's father, Jesse, sends him to take food to his brothers who are fighting on the Israelite side. But trouble's brewing--that big brute Goliath is challenging the Israelites to a fight. No one will take the challenge--he's nine feet tall! Cassie, a spunky little lamb, is determined to watch the battle. When she realizes that her shepherd, David, is going to fight Goliath, she's proud. She's seen him fight lions and bears, and she knows how brave David is. But those Philistines have something to learn about appearances. Even though David isn't as big and bad as Goliath, with G-d's help he claims victory for the Israelite army. By Catherine Storr A shepherd boy leads the Israelites to victory by killing the giant leader of the opposing army. By Catherine Storr David serves as a brave warrior in Saul's armies against the Philistines, and after Saul's death becomes King of Israel. By Bobby Goldsboro A duck named Kwackers tells two Old Testament stories to his friend, a scruffy little mouse named Cheze, and explains what they teach about faith and courage. By Lillian S. Freehof King David's stirring exploits have made him an outstanding hero in the long history of the Jews. From among the many legends Lillian Freehof has selected some of the most dramatic stories of King David, offering readers a portrait of David's life as shepherd, poet, musician, giant-killer, psalmist and king. By Joel Anderson The sequel to the highly praised and acclaimed Jonah's Trash�G-d's Treasure, David and the Trash-Talkin' Giant features the same creative art style using trash to illustrate a story of trusting in G-d. Children and adults alike will have hours of fun with the riddles and seek-and-find activities included on each page. By Frank Peretti Frank Peretti�s inimitable character, Mr. Henry adds his special brand of humor as he retells familiar Bible stories with life lessons kids will be able to apply to their daily lives, offering encouragement to young believers through tales of Bible heroes who weren't always perfect but did great things when they chose to love and obey G-d. Stories are grouped by theme: faith, jealousy, forgiveness, courage, trust, obedience and more.